In this FAQ we explain exactly how the diagnostic tool works and what to do depending on the type of the message you obtained: Error, Warning, Information. Please read carefully the introduction and then each of parts below to understand what type of message you obtained and how to solve the possible issue. The "Dynamic Ads + Pixel" module allows you to test the quality of your feeds before submitting your products into Facebook Business Manager. The diagnostic catches and shows you any more or less important information about your data, so that you can take them into account and make some corrections to your products or your feed configuration before submitting (again) your feed to Facebook. For each type of notice, we will provide you the ability to see which products are affected as well as how to fix the potential issue. Or data missing in your products. These are not due to any module bug. So, please simply refer to the recommendations in the diagnostic tool : you will have all the information needed to be able to get rid of all issues. click on the double red arrow, matching with your feed, to update it : the XML file containing your feed updated data will fill out. A pop-up will open and your feed quality diagnostic according to the Facebook requirement will appear. According to the result, please follow the matching section below. Since Facebook requires this information, otherwise it will not accept your feed (and sometimes even, will block your account), we have decided to not export the products that generate errors in order to protect your account and avoid you penalties from Facebook. If you want to export these products, you must fill in the missing details or correct invalid information. Click on "View details" to see which products are affected and how to fix the issues. In this example, one product has generated an error : indeed, its description is missing or invalid. Well, the description is required by Facebook, so this product will NOT be exported. You get a table, indicating the type of the error (here the description of one or more product(s) is missing or invalid), how many products are affected by a description issue (here only one product because there is only one notice), the description of the issue, the possibility to see the affected products and finally the possibility to learn how to fix the problem. 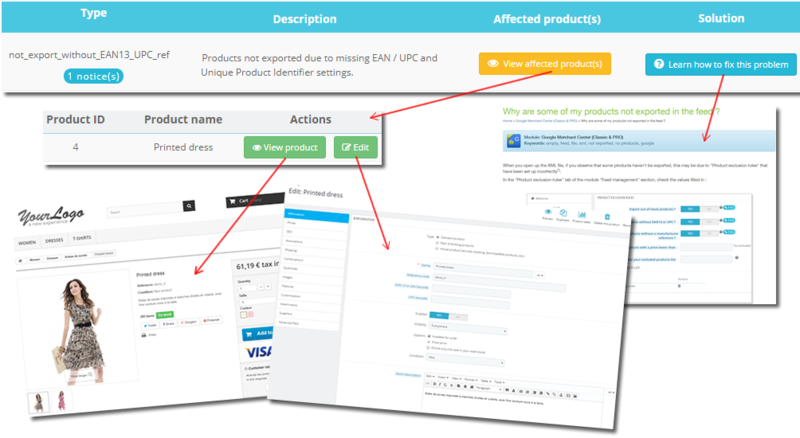 By clicking on "View affected product(s)" you get details about the products and you can access to the product files and edit their form in the back office. 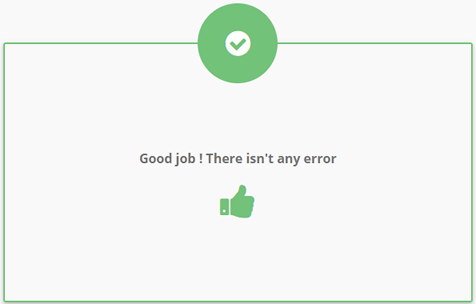 By clicking on "Learn how to fix the problem" you get the documentation that will help you to fix the errors. These are just warnings, not errors and so your products will still be exported. Indeed, these warnings aren't blocking for the diffusion of your product ads, but you have to know that it is recommended, to get the best possible results, to provide a maximum of information about your products. Click on "View details" to find out what these warnings are and which products are affected. In this example, some observations need your attention. Indeed, you have not matched some product categories with the official Google ones (which are also the ones on which Facebook is based). This matching isn't mandatory, so these products will still be exported, but this matching is highly recommended. 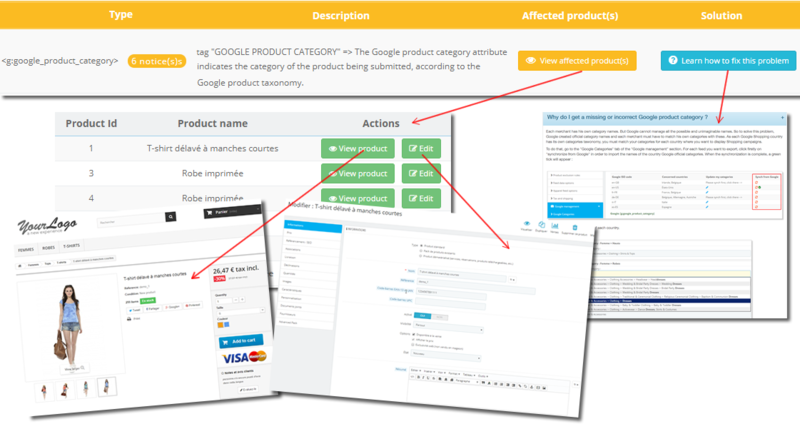 You get a table, indicating the type of the warning (here it's about the matching with Google categories), how many products are affected by this specific type of warning (here six products are affected because there are six notices), the description of the warning, the possibility to see the affected products and finally the possibility to learn how to fix the problem. By clicking on "Learn how to fix the problem" you get the documentation that will help you to fix the problems. 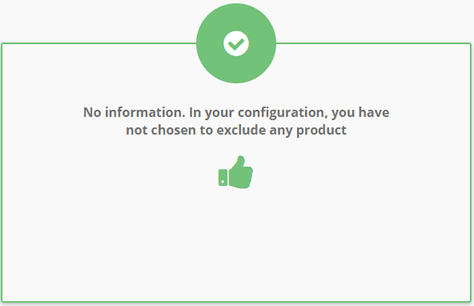 This section will be completed ONLY if YOU have set exclusion rules to not export certain products. 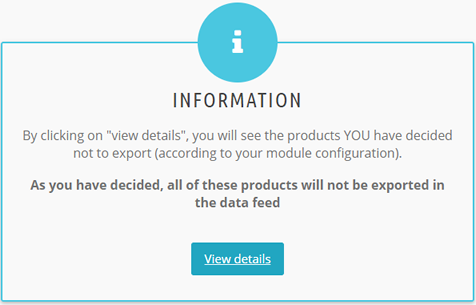 Indeed, the products listed here are those that YOU have decided to exclude when you have configured the module exclusion rules tab. As you have decided, they will NOT be exported. Click on "View details" to check the product list and make sure they match with those you actually don't want to export. 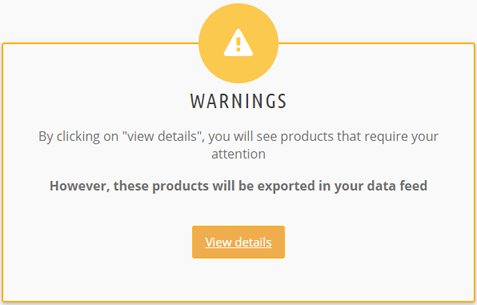 If some products appear in the list whereas you want to export them, go back to the "Product exclusion rules" tab and change the rules to no longer have the error. Well, in his product catalog, 1 article doesn't have this barcode. So, it will not be exported. The reporting gives you a table, indicating the type of the information, that is to say, the reason of the exclusion (here it's about the EAN-13/JAN or UPC code missing or invalidity for one or more product(s)), how many products are affected by this type of exclusion (here only one product is concerned by a barcode missing or invalidity because there is only one notice), some additional information, the possibility to see the affected products and finally, the possibility to access to a detailed documentation, in case where you don't understand why a product is excluded, whereas you didn't want it. By clicking on "View affected product(s)" you can check, for example in the case described here, that the product concerned is actually the one that doesn't have any barcode. You can see that it's the product called "Printed dress", matching with the ID number 4. By clicking on "Modify", you can access to its file in the back office, and you can observe that, it actually doesn't have any barcode. It is therefore in agreement with the exclusion rules that the merchant has defined. 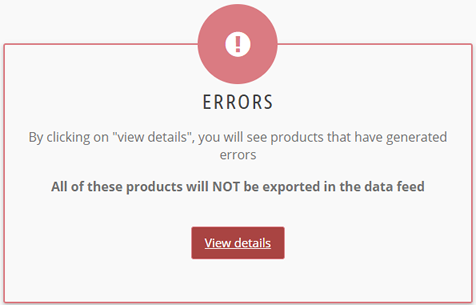 If some products appear in the excluded products list whereas you wished to export them, you can access to the documentation allowing you to understand why they have been excluded, by clicking on "Learn how to fix this problem", and then, you can correct the error.